The first thing to address when discussing content marketing is – how is it different from article marketing? People often confuse the two even though they are quite different. The purpose is to generate targeted traffic, not simply to raise your rank on Google. Top ranking for 100s of keywords is useless unless links back to the website can convert. Both Online businesses and offline businesses with an online presence make the same deadly mistake! They drive traffic to their websites with article marketing; but, neglect the critical step of preparing the website with powerful copy (content) that convinces visitors to take action (trigger conversions). It is a visitor’s first impression of your business, products and services. If your content (website copy) is badly written (typos, grammatical errors, incorrect information, etc. ), it will not capture a visitor’s attention and s/he will quickly leave your site – possibly never to return. 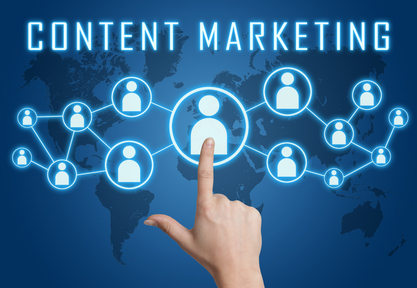 Well-written content can sell products and services to potential customers. It engages the reader and effectively promotes the products and services you offer. Visitors are more likely to investigate further to learn more about the products and services offered, which increases the chance of their making a purchase. Quality content on your website can significantly affect the size of your audience by improving your search engine rankings. Internet users want immediate results. They are looking for user-friendly sites with easy answers. It is widely known that search engine developers understand this and write complicated algorithms that help supply the most relevant websites when a user searches for a particular word or phrase. As a result, people tend to visit websites which rank well in the search engines (found on page 1 or 2).If your website ends up on page 3 or lower, the number of viewers you get will be extremely limited. You lose out on a lot of free advertising. With so much as stake, it would be wise to hire a professional content writer – especially if writing is not your strong suit. If you need to do so, find a writer skilled in writing optimized content to improve your search engine rankings and help you reach more potential customers. If you can’t afford to hire someone and you are a good writer, take the time to learn how to write optimized content yourself. This is not a strategy you can ignore and be successful.